Kh63. 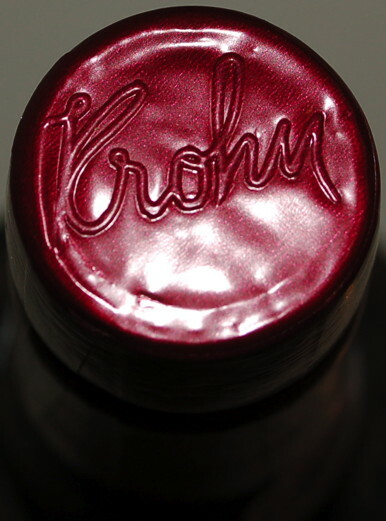 Dark red, 50% opaque. Nose I wrote only ‟best nose so far”. Taste unusual, but lovely. Big sweet dark fruit, marred with something grassy or arboreal. Perfect balance. Extremely long really very very long. Fabulous. And then it weakened. Cedar appeared later, the Port losing power and becoming delicate. Even later it really fell apart. This was a voting problem. As it was at 9½pm, it was WOTN. By midnight, it wasn’t even in the medal table. what to do? I decided to vote ‘as of 9:30’, so gave it first place. But one could quite reasonably have voted ‘as of midnight’, and given it nothing, as the others did. Bottle came directly from the W&K cellar. Floral nose. Dark, big, with lots of dark fruit. Lovely sweet mid palate and a very long mouthwatering finish. Grade A Port. Later I noted “stewed prunes”. This port seemed to have decayed over time in the glass. I tried my glass quite late so my tasting note characterizes this as an OK port but not great. colour: red ruby, good rim; nose: coughing pastilles with a notch "oldish smell"; taste: suggery dessert, pudding port and a bit dull. Good colour, but rather oxidised and not very nice, with burnt overtones. A sweet cola smell. A soft palate a touch yeasty, tawny and dried fruit at the same time. This appears to have a touch of the Peter Pan syndrome. It’s grown old without growing up. A touch clipped on the finish but still pleasant. Mid red-brown with an odd, very dark brown rim; 70% opaque. Bruised plums show on the nose—not particularly attractive, lots of rosemary oil. Very sweet on the palate, with treacle and bitter orange. Note an attractive palate. Long aftertaste, big flavours of burnt toast and strawberry jam leaving a very sweet finish. As a port, this lacks a little balance and focus. 86/100. Drunk 11-Oct-13. Decanted 6½ hours.